We've updated our brochures! The Wisconsin State Law Library just rolled out a completely redesigned and updated brochure, showcasing library services and spaces. Get a preview on our website or stop by a library to pick one up. 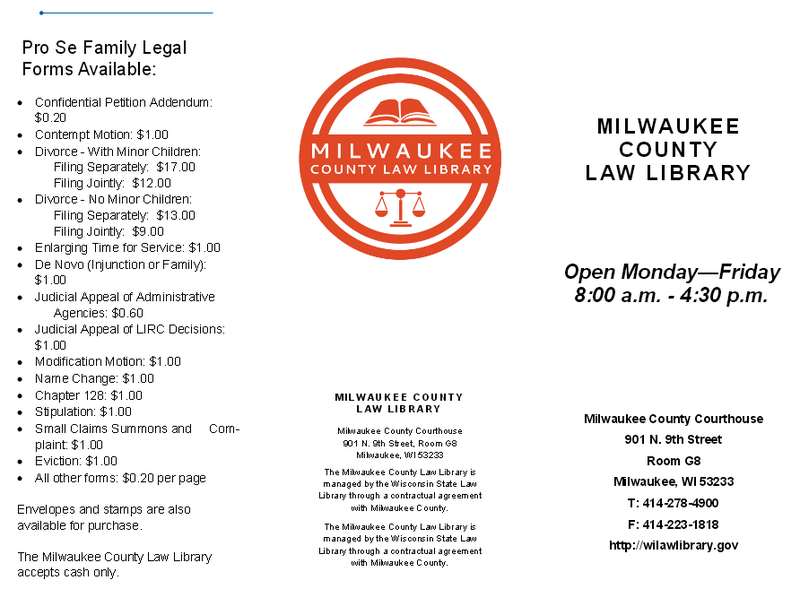 Our two branch libraries also have recently updated brochures to reflect new names (now the Dane County and Milwaukee County Law Libraries) and updated logos. Check out the Dane County and Milwaukee County brochures on our website. 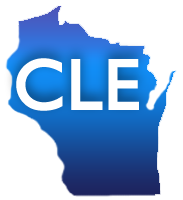 Start planning your fall CLE! Several classes are now open for registration for August and September, and many of them are free. Visit our classes page to learn more and sign up early. Tuesday, August 11, Noon - 1 p.m.
Tuesday, September 8, Noon - 1 p.m.
Tuesday, September 15, Noon - 1 p.m.
Wednesday, August 12, Noon - 1 p.m.
Wednesday, September 9, Noon - 1 p.m.
West's Wisconsin Statutes Annotated pulls together several essential research tools in one convenient location. In addition to statutes, constitutions, and court rules, it includes complete history notes, committee comments, court decision summaries, law review citations, and references to related practice aids, legal encyclopedias, and treatises. 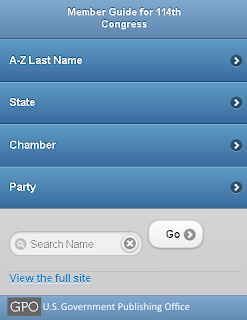 When conducting legislative history research, save time by relying on two unique features of the history note: prior laws (previous numerations) and effective dates of related acts. Another defining element of the Statutes Annotated is the growing collection of "Notes of Decisions," or case annotations, grouped by points of law. Notes of decisions will also have key number topics to broaden your case research using West's Wisconsin Key Number Digest. Each volume has a table of contents and legend for the abbreviations used in the text. The general subject index for the whole series can be found after the last volume on the shelf. Each book individually receives an annual pocket part, or a printed update, while the whole series updates via periodic "Interim Update Service" pamphlets. Check the preface of the pocket part to see what session laws are included in the latest update or verify it in Westlaw. All three of our library locations have public access to Westlaw. When reading a particular statute, click "Currentness" to see the most recent act included in the content. Use the tabs to explore the same valuable sections found in the printed edition, run keyword searches, or browse using the popular name table. Download and email whole documents from our computers at no cost, or bring a laptop to connect to Westlaw through the State Law Library's wifi. 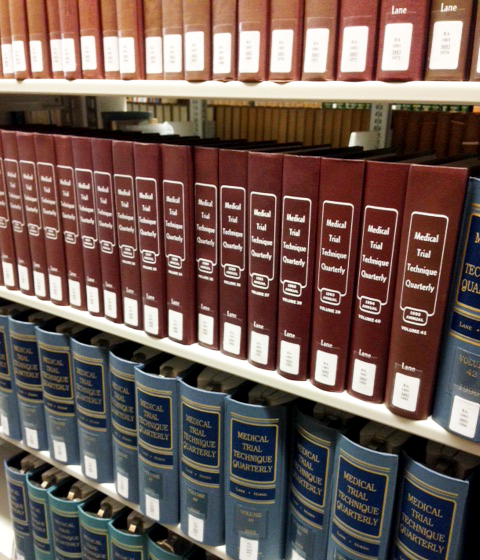 The State Law Library has retired volumes dating back to 1957. 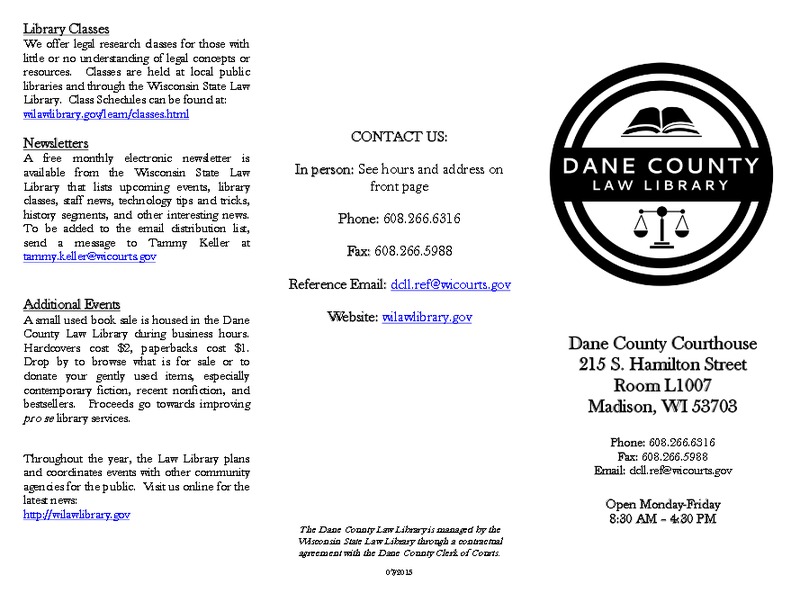 Books can be checked out from both the State Law Library and Dane County Law Library with a library card. Read the July issue of WSLL @ Your Service for the latest library news and tech tips. Odds 'n' Endings: Vacation rentals and fireworks law. 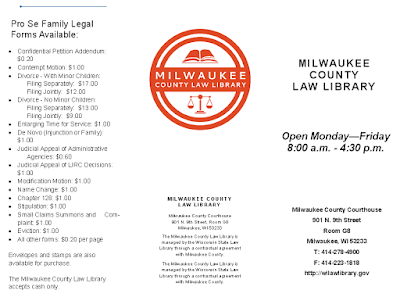 The Milwaukee County Law Library is closed on July 3rd in observance of the July 4th holiday. 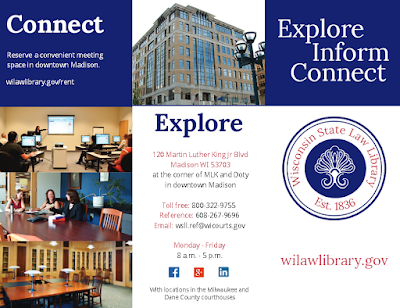 Direct any questions while MCLL is closed to the WI State Law Library reference desk: 608-267-9696. The library will reopen on Monday, July 6th. Black's Law Dictionary defines "exculpatory evidence" as evidence tending to establish a criminal defendant's innocence. The authoritative text on exculpatory evidence is Exculpatory Evidence: the accused's constitutional right to introduce favorable evidence. 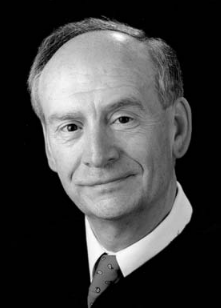 Written by renown experts Edward J. Imwinkelried, UC Davis School of Law and Norman M. Garland, Southwestern University Law School, it is now in its third edition. This detailed treatise offers a comprehensive examination of a defendant's right to present exculpatory evidence. Criminal defense attorneys will appreciate the commentary on successful trial defense strategies and ways to improve the effectiveness of their arguments. 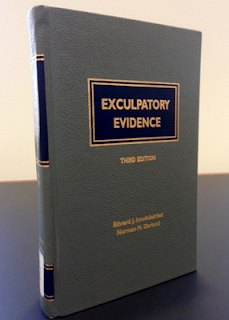 Check out Exculpatory evidence to help you present the best possible defense in your cases. Wisconsin Statute 167.10 addresses the regulation of fireworks in Wisconsin and lists various firework-related devices that aren't regulated, such as sparklers or toy snakes. Anyone looking for a concise summary of fireworks laws should look at the WI Dept. of Justice's Wisconsin Fireworks Law memo. This guide includes a list of items that are generally legal in Wisconsin without a permit, as well as those that are illegal without a permit throughout Wisconsin. It's important to note that further restrictions and enforcement rest with local authorities, so be sure to check local ordinances. 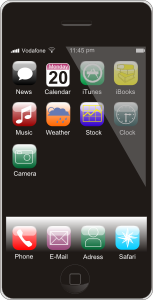 Permits are generally issued by local authorities (i.e. the mayor or person designated by the mayor). The Wisconsin Fireworks Law memo also covers examples of laws and practices you might see for local fireworks regulation. Sign up now for a live webinar from the FDLP Academy, The Abundance of Federal Criminal Justice Websites: Criminal Justice Websites You Should Know. This free webinar is offered on Tuesday, June 23rd from 1-2 p.m. The U.S. Federal Government publishes a variety of resources on criminal justice. The webinar will look at websites for federal departments, statistics, research tools, and evidence based research. The Wisconsin Department of Health issues permits to individuals and businesses for lodging facilities in Wisconsin. Read more at their tourist rooming houses and bed & breakfast permits & laws page. Wisconsin Administrative Code chapter DHS 195 regulates hotels, motels, and tourist rooming houses and DHS 197 regulates bed and breakfasts. This month marks the 800th anniversary of the Magna Carta. On June 15, 1215 King John of England added his seal to the Magna Carta, a document that is frequently cited as inspiring principles outlined in the U.S. and Wisconsin constitutions. We have a number of library resources to share this month. Several books, such as the ABA's Magna Carta and the rule of law, examine its history in the context of our own legal documents. 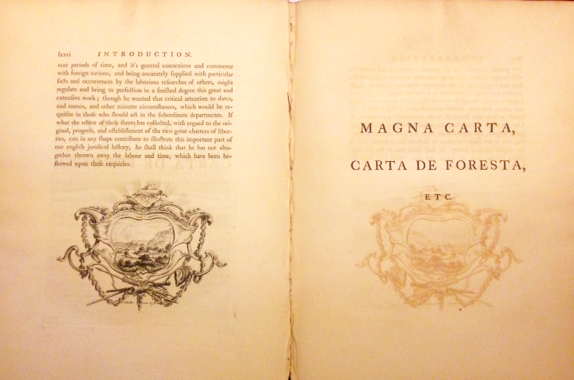 We also have a 1759 Blackstone treatise examining the Magna Carta which includes the text in original Latin with beautiful illustrations (pictured). Stop by the library in mid-June to see our display of books about and related to the Magna Carta and view a framed duplication of the original document. Library cardholders can log in to HeinOnline to search the English Reports collection, which dates back to 1220. Search for "Magna Carta" in the Early American Case Law collection to read older discussions of this historical document in Federal case law. A search in HeinOnline's Law Journal Library for "magna carta" turns up thousands of matches with subjects ranging from prison law to environmental law. Be sure to check out the British Library's translation from Latin to modern English of the original 1215 edition. The U.S. National Archives also includes research sources on their website, relating the Magna Carta to U.S. law. Add our June newsletter to the top of your summer reading list. Get updates on summer CLE classes and catch up with library news. Skim new books in our collection - we've added new ABA books, information technology guides for firms and lawyers, contract and family law form books, and more. Don't miss this month's tech tip: an illustrated guide to legislative history research on the Wisconsin Legislature's website. Use these time saving tips in your next project. Please direct comments to the editor, Lisa.Winkler@wicourts.gov. In a library full of multi-volume treatises the smaller books can sometimes get overlooked. 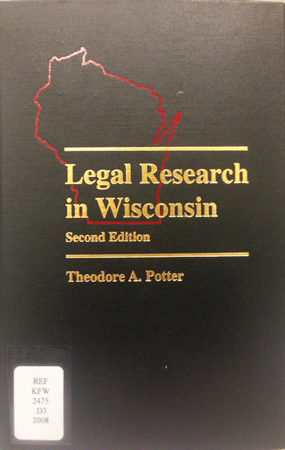 Such is the case with Legal research in Wisconsin, by Theodore A. Potter (former State Law Librarian Jane Colwin was also a contributor). 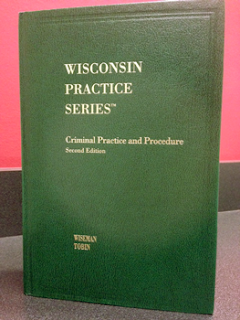 The first two chapters give a concise overview of the history and structure of the Wisconsin Court System, published and unpublished opinions, and case research. The rest of the book includes chapters on statutory research, legislative histories, court rules, administrative law, local laws, and the Wisconsin Constitution. What's invaluable about this book is the comprehensive coverage information for each type of legal authority source. This book is frequently used for its detailed information about where historical sources of the law are published or archived. 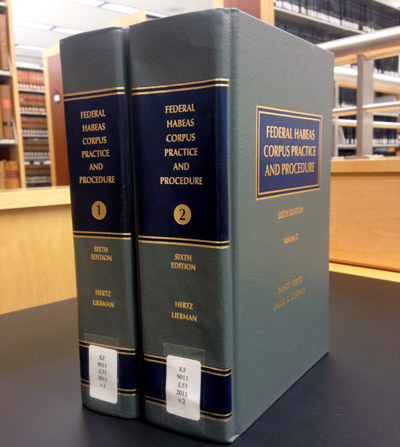 For example, the chapter on statutory research includes title variations and date ranges for older versions of the statutes and their accompanying materials. These references can be very helpful when digging into an older history question. 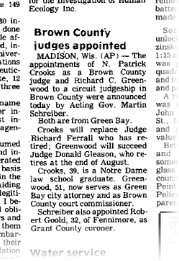 Has it been a while since you researched a Wisconsin Court Order from a statute's history note? Start with this book to learn how those are created and where to find the background materials. Pair this volume with Wisconsin legal research. Written by law librarians Patricia Cervenka and Leslie Behroozi, this book provides an overview of basic sources and strategies on the Wisconsin Constitution, Statutes and court rules, administrative law, and case law. Published in 2011, this book has more information on recent online access to law sources, including popular databases like Westlaw and HeinOnline. The next time you need to step outside of your research comfort zone, turn to one of these books to get up to speed quickly on your topic and find the sources you need fast. HeinOnline is one of our favorite databases. In fact, we're teaching a CLE class on how to get the most out of HeinOnline next week! If you can't make our class (Wednesday, May 20th, noon-1 p.m.) you can still learn a lot about HeinOnline from their support site http://help.heinonline.org/. 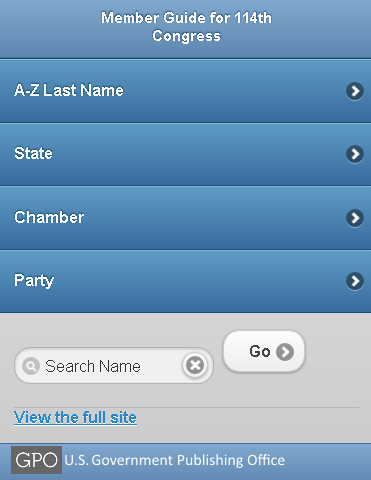 Read FAQs and get library-specific support (with overviews of special search fields and shortcuts). An extensive webinar and online training video archive is also available. System maintenance this evening may affect your ability to log in to our Articles and Journals databases or search our library catalog. Access to library databases like HeinOnline and Index to Legal Periodicals may be interrupted tonight between the hours of 6 p.m. and 9 p.m. This book covers special needs planning for the estimated 43 million Americans who have one or more physical or mental disabilities. 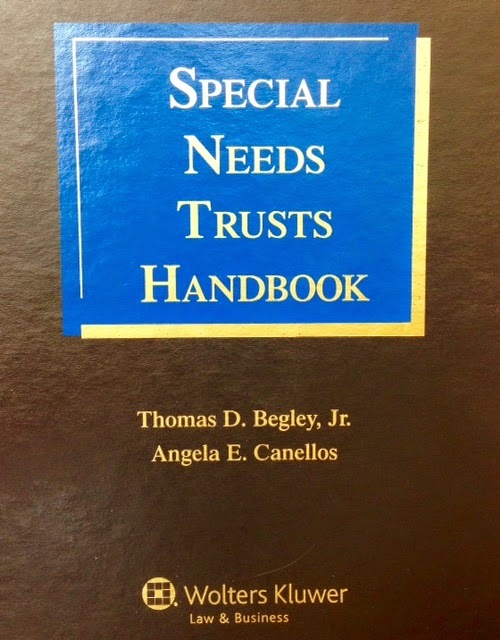 The Special Needs Trusts Handbook enables attorneys to handle the complex requirements of drafting and administering trusts for clients who are mentally or physically disabled, or who wish to provide for others with disabilities. The one-of-a-kind reference helps determine which trust is appropriate, how to draft each trust to cover specific issues, and how to administer each trust making certain that clients maintain public benefits while still receiving funds from the trust. Updated semi-annually, the Handbook also covers a broad range of issues that lawyers in the fields of elder and disability law confront, including specific types of disabilities, the various public and private benefits that are available to person with disabilities; estate planning for parents of children with disabilities; specific types of special needs trusts, and structured settlements in personal injury cases. Also included is a CD containing appendixes with practice forms and other practice aids. This single volume loose leaf binder is authored by Certified Elder Law Attorney Thomas D. Begley, Jr and Wisconsin Elder Law Attorney Angela E. Canellos. We are adding several new books on the practice of law to our collection this spring. In The lateral lawyer (ABA), get tips for switching firms with a focus on partners moving firms. The lawyer's field guide to effective business development walks readers through the process of setting up and maintaining a business. Get into discussions of the future and current status of the law profession in the ABA's The practice : brutal truths about lawyers and lawyering. We also added Ethics for the Wisconsin lawyer (UW Law School, CLEW) and Legal ethics : top challenges (NBI). We'll continue to post new additions to this collection to this blog and a special list in our catalog. All of these books are available to read in the library or check out. 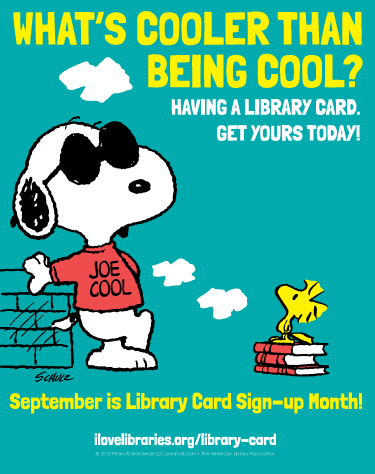 If you don't have a library card yet, you can sign up for a card on our website. Read the March issue of WSLL @ Your Service! Mental Disability Law Civil and Criminal (2d ed.) is a 5-volume award winning treatise by prolific author Michael L. Perlin, Professor of Law, Emeritus. This set covers many areas of the law involving mental illness. Virtually every chapter contains a convenient checklist dealing with the chapter's topical considerations of litigation, procedure, and/or statutory provisions. 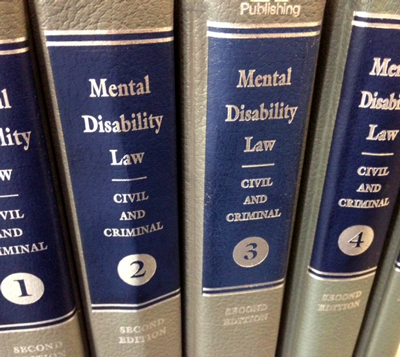 After a brief discussion of the development and historical context of mental disability law, the first volume focuses on involuntary civil commitments, including the role of counsel and procedural rights. The second volume revolves around institutional rights, from the right to treatment to the right to refuse treatment, and beyond. Perlin then moves on to community rights in the third volume. The analysis includes the right to community treatment, deinstitutionalization, and homelessness. There are also chapters on federal statutory rights, state constitutional law, and tort law (focusing on persons with mental disabilities as plaintiffs or "third parties"). Volume four is dedicated to criminal incompetency. There are chapters focused on incompetency to stand trial, the insanity defense, sentencing, and the death penalty, as well as the criminal trial process and how it relates to mental disability. The fifth and shortest volume contains unique content. Among references to the first edition of this title, you can find reprinted historical court orders, pleadings, documents, and court forms. On the whole, the set is a valuable resource for legal practitioners dealing with the various aspects of mental disability law. Each hard bound volume can be individually checked out by eligible borrowers. In January a great new feature was added to the online Administrative Code. When an emergency rule is in place that may affect the chapter being viewed, a highly visible alert box will appear at the top of the page. The emergency rule is linked within the alert box. Simply click on the emergency rule link to read the text of the rule. This feature is only available in the clickable (HTML) version of the online Administrative Code. Emergency rule alerts will not appear if you are viewing the PDF version of a chapter. All current and expired emergency rules are also available in a separate section of the WI State Legislature's document site. 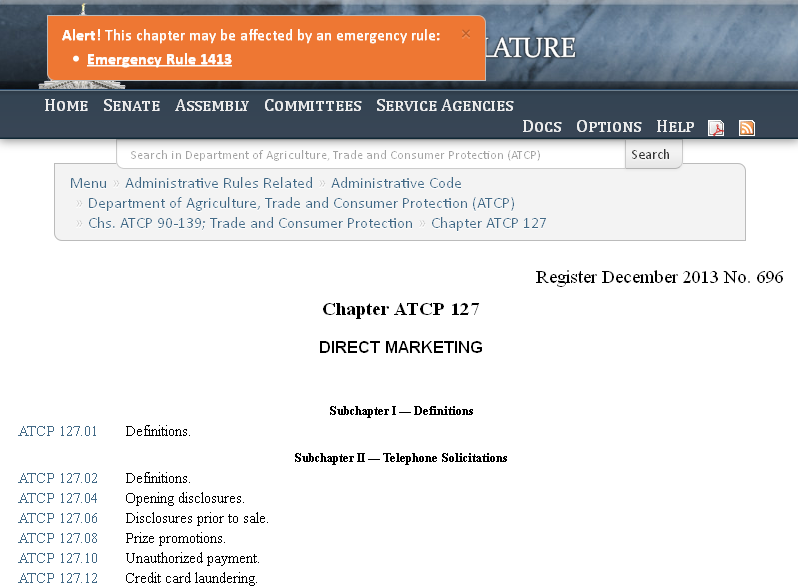 The next time you are researching an Administrative Code section, pull up the chapter from the current, clickable version and check for an emergency rule alert.